The Canon UA-100 USB Adapter allows you to connect an external HDD to your compatible Canon camcorder. 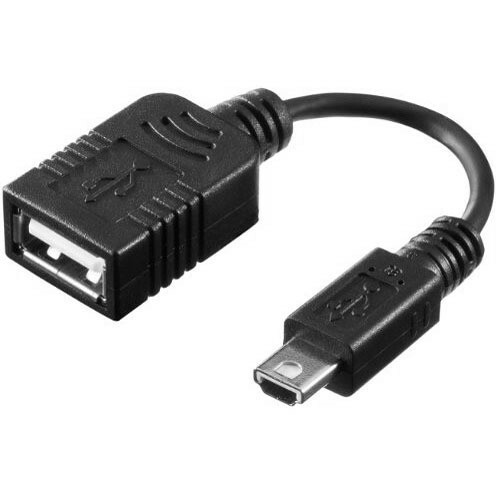 The adapter has a standard A USB female connector on one end and mini-AB USB male on the other end. Box Dimensions (LxWxH) 2.6 x 1.9 x 1.0"
UA-100 USB Adapter is rated 4.0 out of 5 by 5. Rated 4 out of 5 by M. G. from Works as expected Pro: works with external desktop 2TB HDD with external power supply. (Not portable HDD using USB power)Con: Cable is too short. Cost too high. I don't think a USB adapter should cost so much. I think it's just a wire twisted in the adapter, should not exceed $ dollars. But I didn't find any third party supplier. Rated 4 out of 5 by Midnight Taco from Practical This little guy allows me to dump video files from either internal or sd card storage out to my older Western digital Bookdrive. Rated 5 out of 5 by Great Lakes Birder from An able cable... Top quality materials with excellent end connectors. Very fast delivery time. Will it fit the Canon Vixia HF r700? Compatible with vixia hf r60 or 62? The UA-100 is compatible with both the HFR60 and 62. Is this compatible with the Vixia HF R500? The Canon UA-100 is now compatible with the HFR500 as well.